This paper introduces the Agriculture, Forestry and Fisheries Research Council of Japan (AFFRC) model, an integrated model that predicts future rice production in the Mekong River basin by taking into account the effect of global warming on both the water cycle and the rice economy. 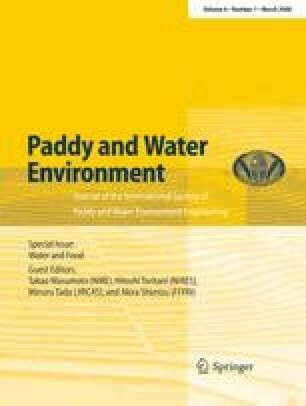 The model focuses especially on the water balance of paddy fields for different farmland water use systems. We defined six categories of irrigated paddies and three categories of rain-fed paddies on the basis of their systems of water usage. We included a process-based model to predict future rice production, accounting for daily changes in available water resources such as precipitation. Many models of crop production treat rice in the same way as other crops; the particular characteristics of rice farming are considered in more detail in our model. Our results show that it is possible to estimate future rice production in the Mekong River basin by taking into account changes in available water, and to model the resultant effects on the grain market. All contributors to the project for “Assessment of the impact of global-scale change in water cycles on food production and alternative policy scenarios” gratefully acknowledge the support of the Agriculture, Forestry and Fisheries Research Council and the Ministry of Agriculture, Forestry and Fisheries (MAFF) of Japan. The joint project includes contributions from the National Institute for Rural Engineering (NIRE), the Forestry and Forest Projects Research Institute (FFPRI), the National Institute for Agro-Environmental Science (NIAES), the Japan International Research Center for Agricultural Sciences (JIRCAS), and other related institutions.